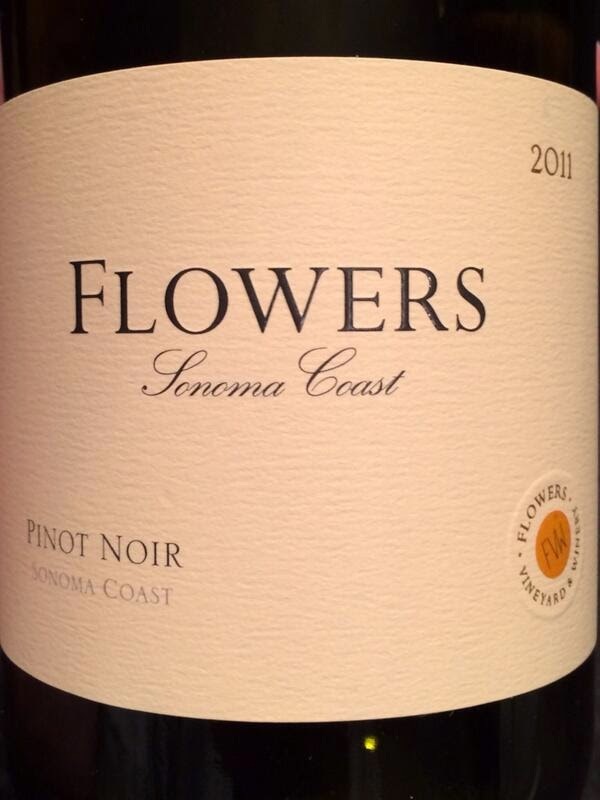 Flowers is an iconic Sonoma Coast Pinot Noir producer whose label you might be familiar with and whose name you've probably seen on high end restaurant lists. But if you're like me perhaps they haven't yet made their way into your regular buying rotation. But after tasting their 2011 that's going to change for me. If you can find their Sonoma Coast Pinot Noir for $40 or less (fully loaded) I think it's a terrific buy because it's a textbook Sonoma Coast Pinot Noir. Perhaps a benchmark wine even. Walt and Joan Flowers purchased 321 acres on the Sonoma Coast two miles from the Pacific Ocean in 1989. Formerly in the nursery business in Pennsylvania, they've developed Flowers into a very well regarded producer of Pinot Noir and Chardonnay. I've tasted their wines - just tasted them - several times over the years. Most recently, their 2010 Sea View Ridge Pinot Noir at the 2013 Wine Spectator Grand Tour in Chicago. I thought it was textbook California Pinot Noir: Vibrant aromatics. Elegant and polished. But it retails for $75 - what am I going to do with that when there are so many great California Pinots in the $30-$45 range? I've previously referred to Flowers as being a "steakhouse Pinot Noir" (as if there is such at thing). What I mean by that is that a) I see their wines on top-end steakhouse lists frequently and b) They're a cab-drinkers Pinot Noir. After tasting the 2011 however, I think the bit about them being a Cab-drinkers Pinot Noir is off the mark. The 2011 Sonoma Coast is decidedly and successfully restrained. A model of total elegance and class, the 2011 Pinot Noir from Flowers is absolutely gorgeous. Savory herbs, crushed flowers, licorice, salt, orange peel, mint and plums are all woven together in the glass. Today, the 2011 is impeccably crafted and flat-out gorgeous. Although very much a medium-bodied wine, I would not at all be surprised to see the 2011 blossom with more time in the bottle. This is an impressive effort. I had a chance to spend some time analyzing their 2011 Sonoma Coast Pinot Noir on a quiet Sunday evening at home. It was fairly spectacular. Medium-full bodied visually, this just jumps out of the glass aromatically. Gorgeous strawberry and floral aromatics with supporting forest floor and cola notes. Classic California Pinot Noir. The initial attack is fruit forward but quickly turns lean, reflecting its restrained alcohol levels. But it's remarkably satisfying and well balanced. This is really well done. Their property looks gorgeous and I'd love to visit some day. Question of the Day: Have you ever had Flowers Pinot Noir? If so, what are some of your favorite bottlings?